Hot tea has a long history of social and ceremonial use in many civilizations, and the glass tea pot is a pleasant way to enhance the enjoyment of brewed tea. The glass tea pot, unlike its opaque counterparts, allows the tea drinker the simple pleasures of watching dried tea leaves dancing as they release their flavor into the water, or the fascination of watching blooming tea balls unfurl their beautiful display of color. The glass tea pot, however, is more fragile than other tea pots and requires some care to ensure the safety of both the pot and the tea drinker. Warm the pot by adding hot water and allowing it to sit for a few minutes. While some glass tea pots, especially those made of borosilicate glass, can withstand sudden changes in temperature, it is safest to warm the glass slightly before adding the boiling water. Pour out the warming water and insert the filter with tea leaves already measured into it. If your glass tea pot includes a filter and you are using loose tea leaves, measure the tea into the filter as directed by the tea package -- different types and blends of tea require different ratios of leaves to water for the best flavor. Place the leaves in the bottom of the filter and set the filter into the empty teapot. 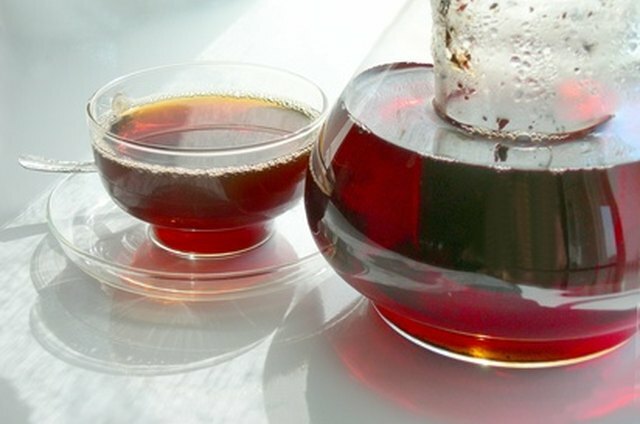 If your glass tea pot does not include a filter, simply place the loose leaves in the bottom of the pot. Pour hot water over the tea leaves in the filter, filling to the shoulders of the pot. When brewing loose tea, it is best to use water that is about 180 degrees F for lighter teas, such as white, green and oolong, and boiling water -- 212 degrees F -- for black and herbal teas. Put the lid on the tea pot and allow the tea to steep for the recommended amount of time. 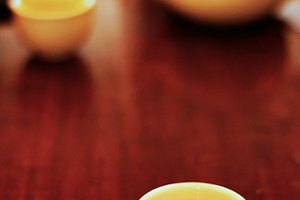 Light teas brew for shorter periods of time, while black and herbal teas may require up to 5 minutes to extract the full flavor from the leaves. Pour the tea into individual cups. If your tea pot does not have a strainer, you may wish to pour the tea through a tea strainer as you fill the cups. As the glass pot will be warm, protect your hands by using an insulated pad to support the bowl of the pot as your pour. Warm the pot by adding hot water and allowing it to sit for a few minutes before pouring it out. Add hot water to the tea pot, filling to the shoulders of the pot. The water should be just below the boiling point -- between 180 and 200 degrees F -- for most blooming tea balls. Add the blooming tea ball to the hot water. When using a blooming tea ball, do not use the filter, as it can restrict the expansion of the flower construction. Add the tea ball to the hot water. This prevents the force of the pouring water from breaking the tea ball before it can open naturally. Place the lid on the tea pot and allow the tea to steep for the recommended length of time. 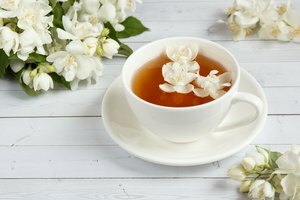 Blooming teas take longer than loose leaf teas, as the water must penetrate to the interior of the ball before the full flavor of the tea can be released. Empty the pot of tea and spent leaves. Use a gentle dishwashing soap and warm water to wash the interior and exterior of the pot. You may find it easier to clean the spout with a small bottle brush. 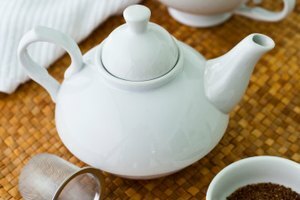 Because glass is less porous than porcelain, your glass teapot is unlikely to become stained, especially if you do not allow cold tea to stand in the pot for long periods of time. Allow the pot to air dry if possible. This prevents your next pot of tea from being contaminated with towel lint. Store the pot in its original packaging for optimum safety. If this is not possible, ensure that the tea pot is stored in a place where it cannot accidentally be brushed from the shelf, and where other dishes will not knock against the spout or handle. Glass tea pots do not retain heat as well as porcelain or cast iron pots, so you may wish to cover the pot with a cozy once you have poured the first cups of tea. Glass tea pots can become just as hot to the touch as cast iron, so handle with care, using insulated pads if possible. To protect table surfaces, set them on a trivet or an insulated pad.